See, this is why you don’t invite ants to the picnic – they show up uninvited and take all of the leftovers without asking. Inconsiderate bug-gers. 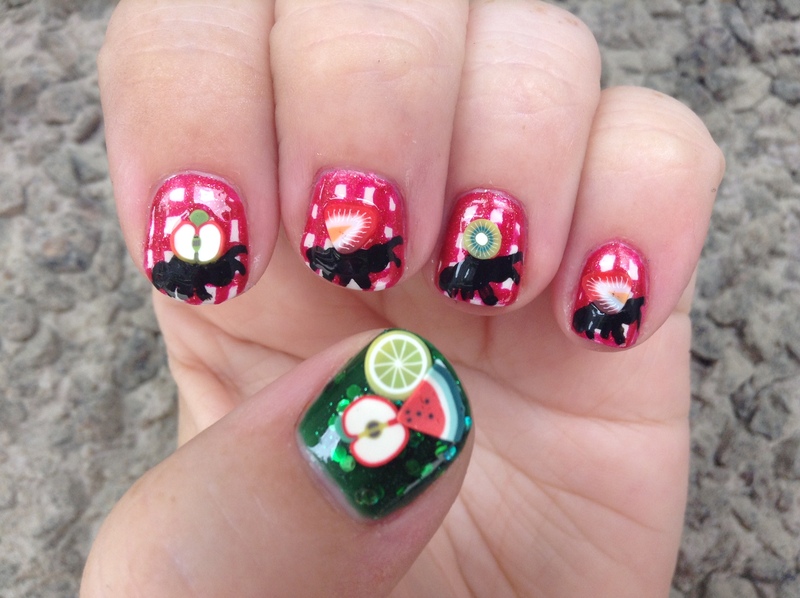 There are a number of ants-at-the-picnic nail art designs out there, but I took inspiration from the work of an Instagram blogger whose post I can of course no longer find. That person used little fimo cane fruits in place of simply painting them on the ants’ backs. 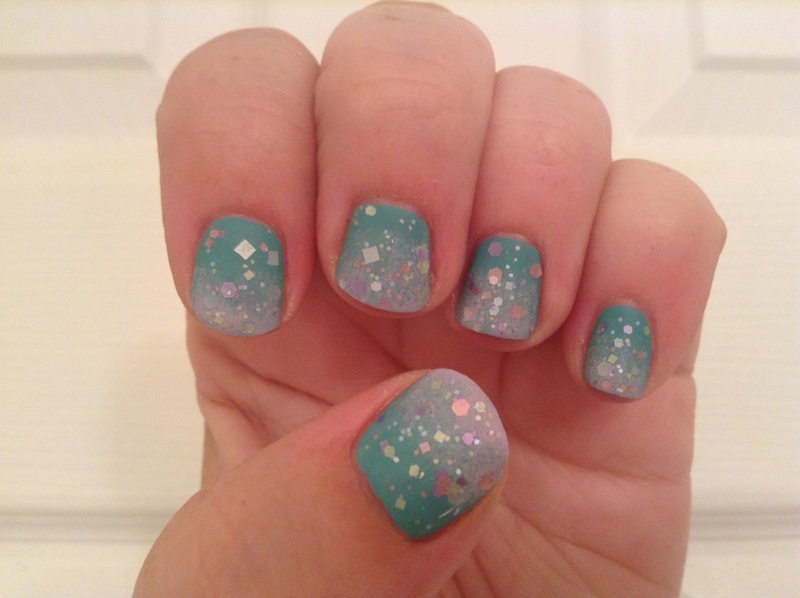 It’s a great, inventive use of standard nail art materials that perfectly fits the picnic theme, and so I stole it, tweaked it a bit and made it my own. Now somebody call the exterminator – we’ve got some unwelcome dinner guests to evict. 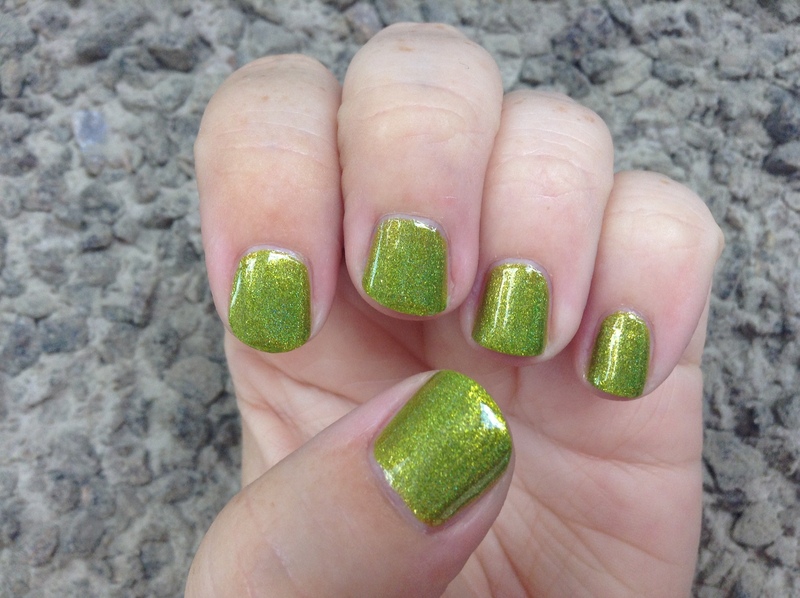 This polish is totally lawn in a bottle, right?! 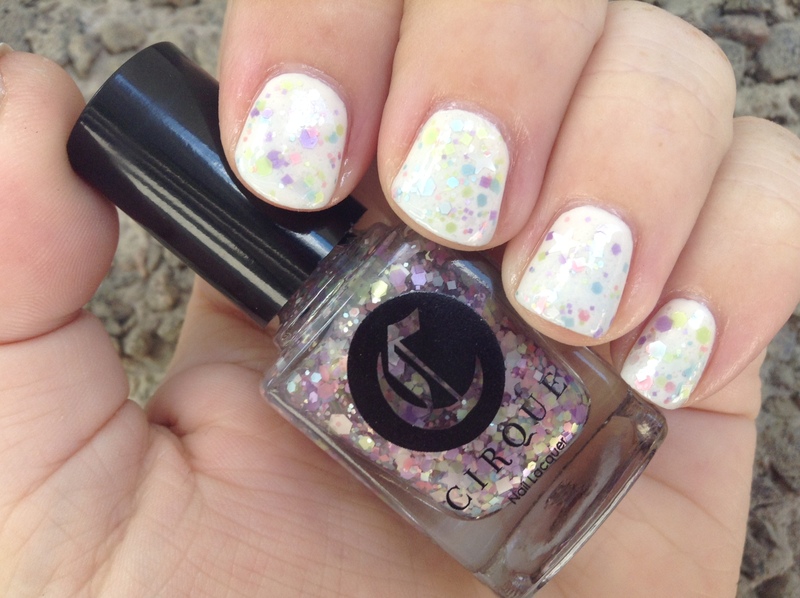 I purchased this shimmer-flecked holo, Cirque’s Panacea, after admiring a number of swatches that showed it as a bright, citrusy, rainbow-throwing beauty. But when I got my bottle, the colour seemed far too golden to be flattering against my pink paleness, and the holo effect was virtually non-existent. More like bummer in a bottle. Fortunately, though, Panacea is one of those polishes that’s a bit of a Monet, as the great Cher Horowitz might remark – at a distance it’s all right, but up close it’s a big old mess. 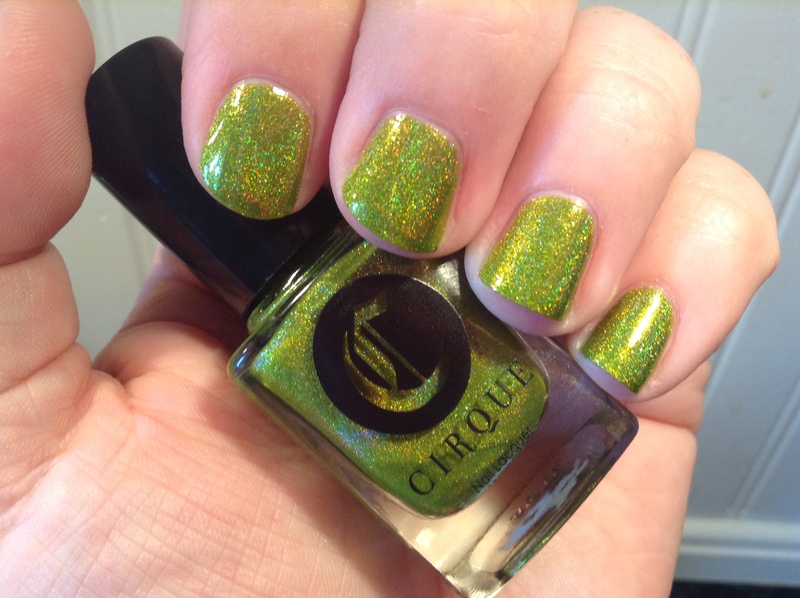 I can’t explain the kind of beauty-dampening effect that takes place with this polish when it’s in the bottle, but paint on a few coats and give it a bit of space to play in the sun, and suddenly it’s a gorgeous grass green holo packed with light-reflecting golden shimmer. Now that’s the Panacea I love, and yet another lesson in not judging a book by its cover. 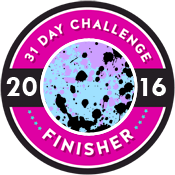 In about a month this blog will be celebrating its first year of existence. At the same time I’ll be marking a personal milestone, pouring one out for myself in celebration of one year of close-to-daily writing, blogging and nail art pursuits. I danced recreationally for close to 20 years, half of that time with the same company, so I understand what it means to stick with something for the long haul. 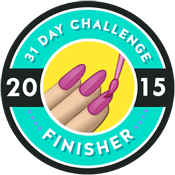 But I’m still sort of amazed and, quite frankly, impressed when I contemplate the 400 some-odd manis I’ve done over the past 365 days, to say nothing of the written words that have flowed there from. Where did I find the inspiration to do that many manicures? Or more accurately, where did I find the time to paint my nails that many times? 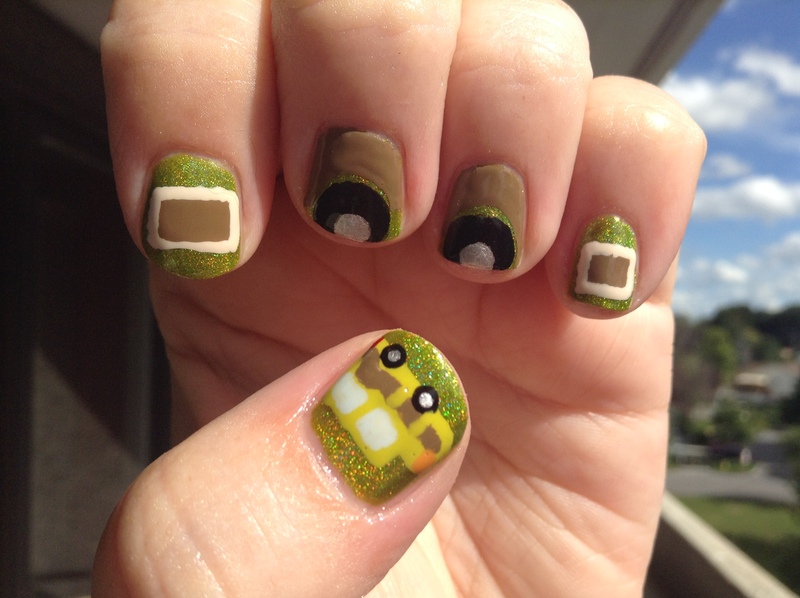 And how could I possibly have had that much to say about nail art? 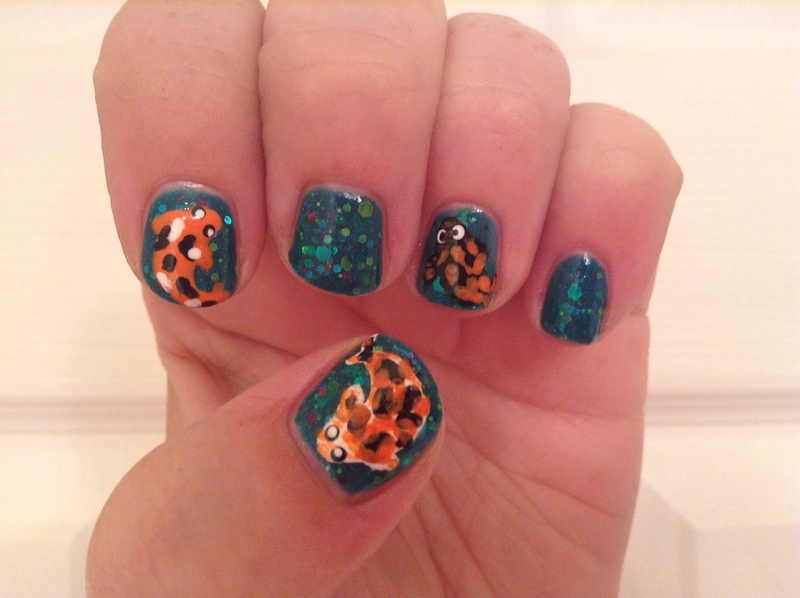 While providing no real answers to those questions, this post, my 400th, bears out my obsessive/casual approach to writing, blogging and nail art and how the three have come together to form a most enjoyable pursuit that’s just structured enough to keep me engaged and on task, while still allowing me the freedom to float around in more creative spheres. 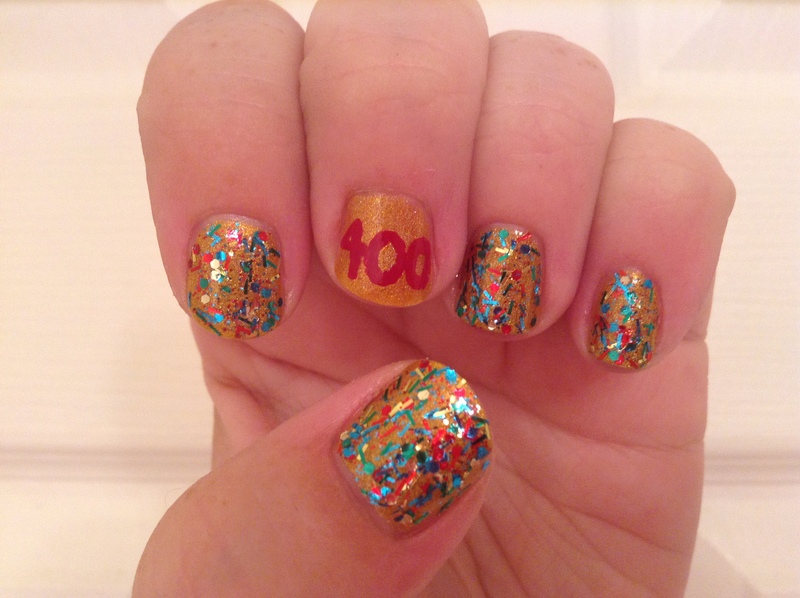 I’m lucky enough to have found that perfect mix of “I should do this” and “I want to do this” that has brought me to this 400th post, so maybe I shouldn’t question it so much and just go with the (nail polish) flow? Sounds like a non-plan. Here’s to the next 400! For these festive nails celebrating my blog’s quadricentennial post, I topped two coats of Cirque’s marigold-hued Chyrsopoeia with one coat of Nails Inc.’s Graffiti in Old Street. 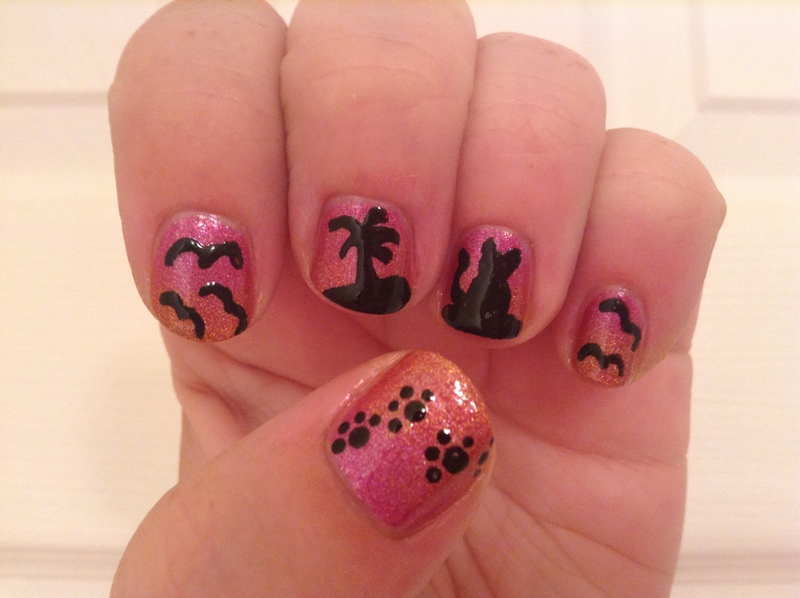 As the final weekend of summer kicks off, I thought it would be fun to cram in all the vacation, leisure and beach-inspired manicures I’ve been putting off for the past two months. I think I was so shocked by the fact that summer actually happened, I forgot to tackle all those seasonal manicures I was dreaming about back when we were buried under eight feet of dirty spring snow. …try it four more times! That’s what I call determination in making a nail polish work, friends. A bit of back story. 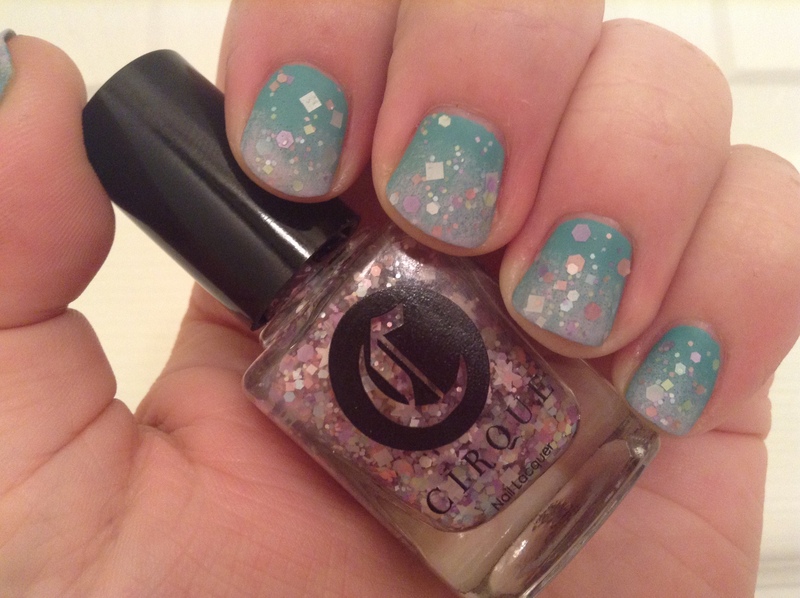 I bought the glitter polish I used in this matte gradient manicure, Cirque’s Lullaby, after lusting after it for the better part of a year. 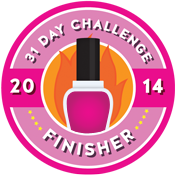 I never purchased it because I questioned how much utility I’d get out of such a pale polish. And as it turns out, my fears were indeed nearly entirely founded, because swatching Lullaby has been something of a satin pastel nightmare. First I tried it over white. So pretty and delicate in real life, uncaptureable on camera. The problem with standard white as a base (actually, not so standard; for this mani I used one coat of Lullaby over a blue-on-white gradient using a couple of Model’s Own scented polishes, although you’d never know it) is the polish’s little white stars get lost against the background. And with its satin finish glitter, Lullaby tends to almost sink into the base polish, the soft glitter colours blending into one another. Then I tried it over holographic pink. 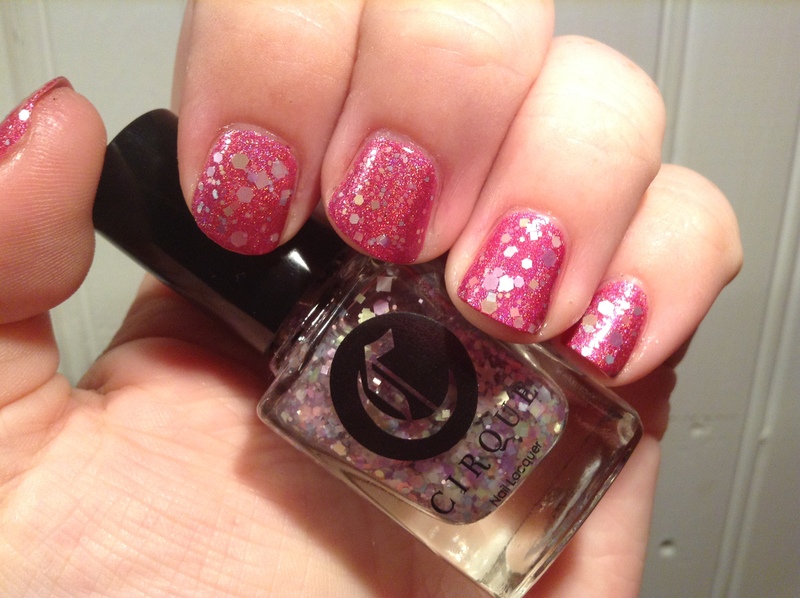 That was also a big ol’ negative, as the pink blindingly outshone the glitter, and Lullaby once again seemingly merged with its background polish. My favourite National Lampoon’s Vacation movie is Christmas Vacation, but I have fond memories of watching the Griswold family navigate their giant, wood-panelled station wagon across the California desert in the original movie on their way to vacation hotspot Walley World, which is, regrettably for the Griswolds – spoiler alert! – closed. Clark has a not-too-surprising breakdown and storms the gates of the theme park, taking a random maintenance worker hostage and pressing him into not-totally-unwilling action in getting the dormant rides up and running. The family is very nearly arrested (when are they not? ), and there’s a fantastic scene somewhere in there where Clark and his son, Rusty, run in delirious slo-mo towards the gates of the park as Chariots of Fire plays in the background. In the end they all learn the value of love and family and return to Chicago with surprisingly few criminal convictions. I always thought the cherry on the crap sundae was the colour of the Griswold family station wagon, which Clark describes as “Electric Pea” (“Electric Pee” would also be quite apt.) 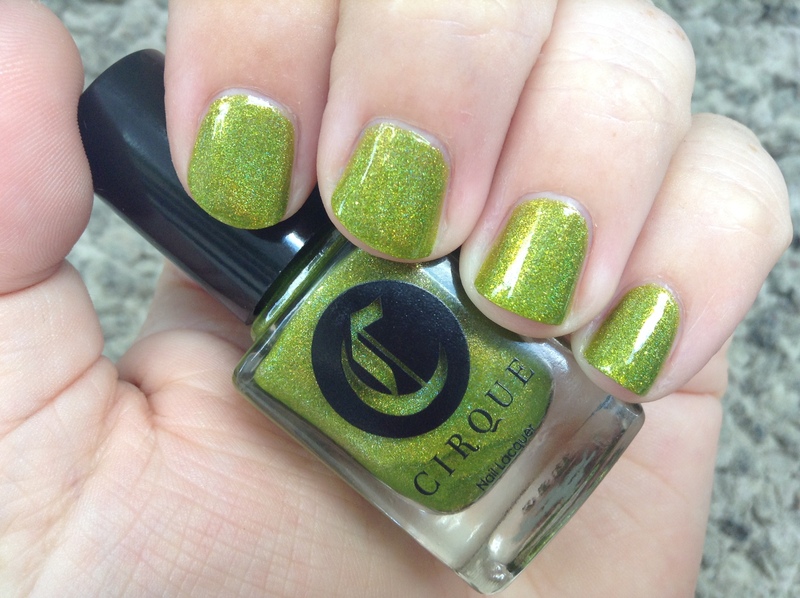 That’s the first thought I had upon swiping on a few coats of this new green Cirque polish, Panacea, which looks every bit like the detailing work on the Griswold family boat. For these nails, I attempted to capture some of the highlights of the Electric Peamobile, including its decorative wooden side panels and square, no nonsense profile. 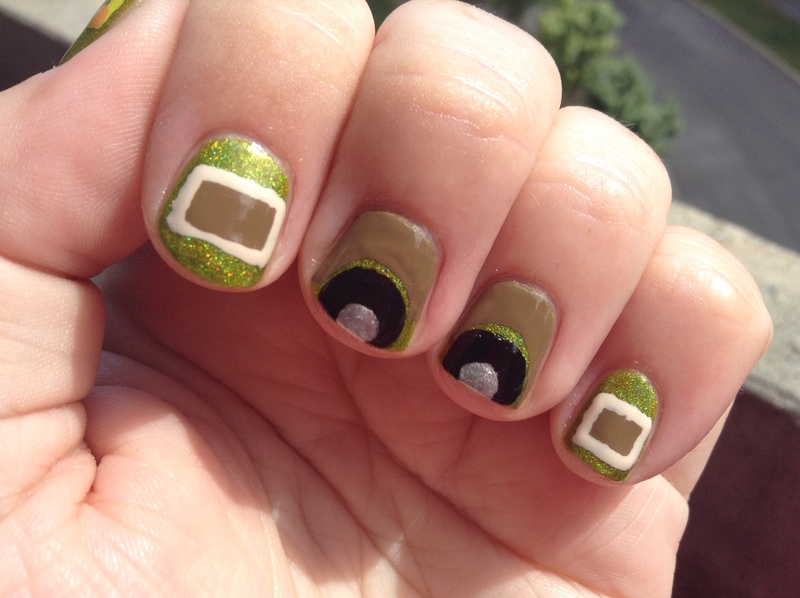 You’ve got the right nails now, so jump on in and hit that Holiday Road! Just remember to check the Walley World schedule before you leave.